Othello (also known as The Tragedy of Othello: The Moor of Venice) is a 1951 drama film directed and produced by Orson Welles, who also adapted the Shakespearean play and played the title role. Recipient of the Palme d'Or at the 1952 Cannes Film Festival, the film was distributed by United Artists when it was released in the United States in 1955. Othello was filmed on location over a three-year period in Morocco, Venice, Tuscany and Rome and at the Scalera Studios in Rome. In addition to Orson Welles, the cast consisted of Micheál MacLiammóir as Iago, Robert Coote as Roderigo, Suzanne Cloutier as Desdemona, Michael Laurence as Cassio, Fay Compton as Emilia and Doris Dowling as Bianca. Three versions of the film have seen theatrical release — two supervised by Welles, and a 1992 restoration supervised by his daughter, Beatrice Welles. Welles trimmed the source material, which is generally around three hours when performed, down to a little over 90 minutes for the film. One of Welles's more complicated shoots, Othello was filmed erratically over three years. Shooting began in 1949, but was forced to shut down when the film's original Italian producer announced on one of the first days of shooting that he was bankrupt. Instead of abandoning filming altogether, Welles as director began pouring his own money into the project. When he ran out of money as well, he needed to stop filming for months at a time to raise money, mostly by taking part in other productions. Because of lack of funds, production was stopped at least three times. The film found some imaginative solutions to a range of logistical problems; the scene in which Roderigo is murdered in a Turkish bath was shot in that form because the original costumes were impounded and using replacements would have meant a delay. One of the fight scenes starts in Morocco, but the ending was shot in Rome several months later. Welles used the money from his acting roles, such as in The Third Man (1949), to help finance the film, but this often involved pausing filming for several months while he went off to raise money; and these pauses were further complicated by the shifting availability of different actors, which meant that some key parts (like Desdemona) had to be recast, and whole scenes then reshot. This lengthy shoot is detailed in Micheál MacLiammóir's book Put Money in Thy Purse. When Welles did The Black Rose in 1951 he insisted that the coat his character, Bayan, wore be lined with mink, even though it would not be visible. Despite the expense, the producers acceded to his request. At the end of the film the coat disappeared, but could subsequently be seen in Othello with the fur lining exposed. Welles was reportedly extremely satisfied with the film's musical score by Angelo Francesco Lavagnino, and Lavagnino again provided the musical scores of Welles's two subsequent Shakespearean films, Chimes at Midnight (1965) and The Merchant of Venice (1969). 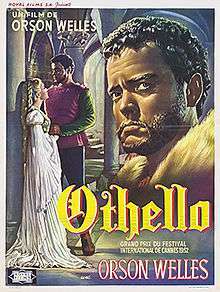 A dubbed version of Othello premiered in Rome, Italy on 29 November 1951. Welles's original English-language version premiered at the Cannes Film Festival on 10 May 1952, and went on general release in Europe. Unlike that of the subsequent American cut, the soundtrack was generally without flaws, apart from some dubbing that was slightly out of sync. It features different edits of many scenes from the other two versions, with alternate camera angles used. A print remains stored in the Paris Cinematheque. This is now out of print, and the only domestic release was a 1990 French VHS cassette with French subtitles, as part of the "Palme d'or - Fil à film" series. This version ran to 92 minutes. Welles supervised a different version of Othello for the American market, a 93-minutes cut released on 12 September 1955 in New York City. This had a number of minor editing changes and several major soundtrack changes, including Welles's replacement of his spoken-word titles with written credits (requested by the film's distributor, United Artists) and the addition of a narration by Welles. Suzanne Cloutier's entire performance was dubbed by Gudrun Ure, who had previously played Desdemona opposite Welles in a 1951 theatre production of Othello that was staged to raise funds to complete the film. Paul Squitieri, in a 1993 PhD study of the film in its various forms, argues that the U.S. version represents a "compromise", with some of the changes forced on Welles, and that the original European cut represents the truest version. A Criterion LaserDisc of this version came out in 1994—the only time it was commercially released—but was withdrawn from sale after legal action by Welles's daughter, Beatrice Welles. Welles featured Othello clips in his 1978 "making of" movie, Filming Othello, but in fact these had all been completely re-edited by him for the documentary, and so do not appear in the original film in the same form. The clips were all accompanied by a voice-over from Welles, so that no part of the original soundtrack was heard in Filming Othello. Released in Europe to acclaim in 1952, Othello won the Palme d'Or at the Cannes Film Festival under the Moroccan flag. Welles could not find the film a distributor in the United States for over three years, and even after its U.S. release it was largely ignored. The film was re-released to theaters in a 1992 restoration that screened out of competition at the 1992 Cannes Film Festival and was shown to acclaim in the United States. The film has a 90% fresh rating on Rotten Tomatoes, with the consensus view being "this ragged take on Othello may take liberties with the source material, but Orson Welles's genius never fails to impress." In 1992, Beatrice Welles-Smith, daughter of Orson Welles, supervised the restoration of the film, which saw over $1 million spent on improving the picture quality, re-synching the audio, adding extra sound effects, and completely re-recording the music in stereo. Although the restoration was greeted with positive reviews upon its release, it subsequently came under attack for numerous technical flaws and alterations. Further alterations were made between the restoration's theatrical release and its home media release, after complaints that the opening scene lacked the Gregorian chanting it had previously had, and another scene was missing entirely. This is the only version which has been available on VHS and DVD since the mid-1990s, since legal action by Beatrice Welles has blocked either version released by Orson Welles from being sold. This version runs to 91 minutes. Multiple film historians criticized the restoration work. Jonathan Rosenbaum argued that numerous changes were made against Welles's intent and that the restoration was incompetent, having used as its source an original distribution print with a flawed soundtrack. In fact, the visual elements of the 1992 restoration utilized a fine-grain master positive—discovered in a storage in New Jersey—as its source, not a distribution print. The audio came from a distribution print that was re-synchronized, virtually syllable-by-syllable by the restoration team to match the master positive. As some voice parts had music underneath, the newly recorded music and effects track had to match whatever music was underneath the dialogue, leading to inconsistencies. The flaw in the American cut's soundtrack is how white noise is audible in the background throughout dialogue and music, but that the noise cuts out when there is no action—meaning the white noise is more noticeable whenever it returns. The restoration sought to minimize this problem, but it is still present in places. By contrast, the white noise problem is not present to begin with in Welles's original 1952 European cut. Rosenbaum makes several charges of incompetence on the restoration team's part, including that the restoration team were unaware of the European cut's existence, and instead based their work on the American cut which was farther from Welles's original vision. The team recut the order of entire scenes to make the dialogue match. One scene was inexplicably missing from the cinema release, but restored for the video/DVD release. The opening scene, in cinema release, was lacking the important Gregorian chanting, but this was restored for the DVD. The soundtrack attracted particular criticism. Instead of consulting the papers of composer Angelo Francesco Lavagnino, where a full copy of the score survives, the restorers instead chose to transcribe the music from the poor-quality audio of the print they had, with numerous mistakes having been made — Lavagnino's son has gone so far as to argue the new score is so different it is no longer his father's work. The new score was also recorded with arguably less impressive resources than the original version—although Welles only used a single microphone for a monaural soundtrack, he had 40 mandolins playing in his version, while the new stereo soundtrack used three. Further, Rosenbaum states that in Beatrice Welles refusing to give permission for her father's version to be shown or released, Beatrice "effectively made her father’s version of the film (as well as, more indirectly, his final feature, Filming Othello) illegal, so that she can make more money on her own version", since she only receives royalties on the version which she restored. Many of these criticisms have been subsequently echoed by other scholars such as David Impastato and Michael Anderegg. Anderegg particularly criticizes the bold claims made by the restorers at the time of the film's 1992 release, including Beatrice Welles's statements "This is a film that no one has seen", that it was a "lost film", and that it was "never given a theatrical release" (all of which are untrue), and he dismisses as hyperbolic the judgment of film restorer Michael Dawson that Welles's original dubbing was like "Japanese sci-fi." Instead, Anderegg argues that Othello was simply seldom screened. Jonathan Rosenbaum has defended the out-of-sync dubbing of some lines in Welles's original version, pointing out it was typical of European films of the early 1950s, and likening modern attempts to resynchronise it to the proposed colorisation of Citizen Kane. As of 2013, the 1992 restoration is out-of-print in the U.S., while the two versions released by Orson Welles remain unavailable due to Beatrice Welles's legal action. It was announced that Criterion was planning to release the restoration on Blu-ray and DVD in autumn 2015. Beatrice Welles hoped that the Criterion release would "bring Othello to audiences too young to appreciate our first restoration and for audiences who saw either the first release in the '50s and the first restoration in the '90s." In 2014 Carlotta Films US released a 2K digital restoration of the 1992 version on DCP. This digital version premiered in Dallas at the 2014 USA Film Festival, and subsequently played in other cities on the art-house circuit. The New Yorker reported that the monaural soundtrack was a great improvement on the previous version of the restoration — "much more appropriate for a low-budget, black-and-white 1952 release." ↑ "Othello (1955) Screen: Orson Welles Revises 'Othello'; Scraps Shakespeare's Plot for Visual Effect". The New York Times. Retrieved 2012-01-07. ↑ Anile, Alberto. "Orson Welles in Italy". Google. ↑ "Festival de Cannes: Othello". festival-cannes.com. Retrieved 2009-01-18. ↑ "Festival de Cannes: Othello". festival-cannes.com. Retrieved 2009-08-17. ↑ "The Tragedy of Othello: The Moor of Venice (Othello)". rottentomatoes.com. 10 May 1952. Retrieved 16 May 2015. 1 2 "Orson Welles's OTHELLO". jonathanrosenbaum.net. Retrieved 16 May 2015. ↑ Michael Anderegg, Orson Welles, Shakespeare and Popular Culture (Columbia University Press, New York, 1999) pp.110-20, which contains a detailed analysis (and criticism) of the competence of the restoration. ↑ "Wellesnet - Orson Welles Web Resource". Wellesnet - Orson Welles Web Resource. Retrieved 16 May 2015. ↑ "A Tragic, Poetic, and Visually Stunning Work from the Director of Citizen Kane" (PDF) (Press release). Carlotta Films US. 2014. Retrieved 2015-06-04. ↑ "2014 USA Film Festival Program". Retrieved 2015-06-04. ↑ Michael Phillips (2014-04-24). "Orson Welles' 'Othello' a work of complex origin (Review)". Chicago Tribune. Retrieved 2015-06-04. ↑ "Othello (program note)". Gene Siskel Film Center. 2014. Retrieved 2015-06-04. This new 2K DCP digital edition is based on the 1992 restoration (supervised by Welles's daughter Beatrice Welles-Smith) that greatly improved existing versions’ visual quality and audio clarity (the latter with alterations that drew divided responses from film critics and scholars). ↑ "National screening dates for restored 'Othello'". Wellesnet. 2014-05-02. Retrieved 2015-06-04. ↑ "Othello (program note)". The Cinematheque. 2015. Retrieved 2015-06-04. ↑ Brody, Richard (April 25, 2014). "Orson Welles's Shattering Othello". The New Yorker. Retrieved 2016-01-15.